CodeMix is an Eclipse plugin that delivers exceptional support for TypeScript in Eclipse, and gives you the ability to add Code-compatible extensions directly into Eclipse to further enhance your TypeScript coding experience. CodeMix is compatible with Eclipse-based IDEs and tools like MyEclipse, Spring Tools Suite, and JBoss Tools, so you can continue working in the environment you are accustomed to. For a hands-on learning experience, check out CodeMix eLearning! Content assist suggestions appear as you type. When you use a suggestion to insert a class that hasn’t been imported, the import is added as well. Documentation popups present documentation when available, including the display of parameter info, as you type in a method’s parameters. Code mining—Get valuable context information by viewing the number of references and implementations inline with your code. Find references—Quickly view and navigate to references in your code. Snippets—Reduce the time required to write common pieces of code, or even boilerplate in some cases. 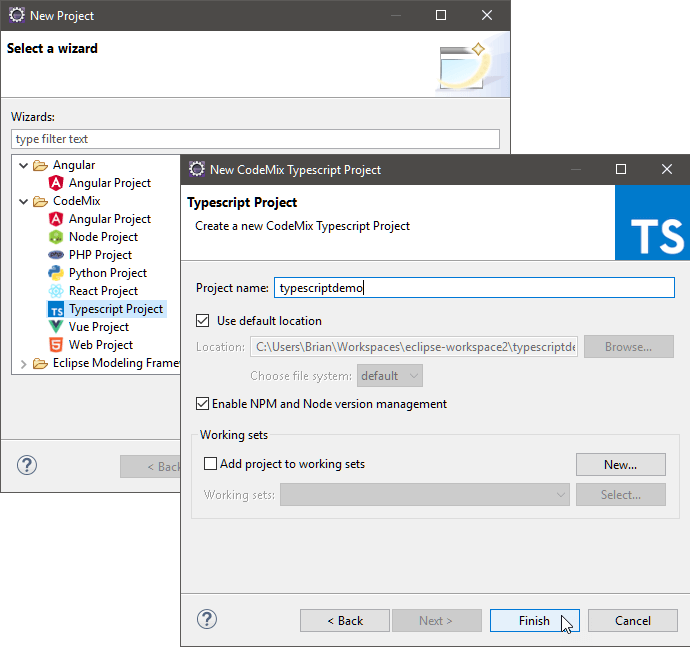 A wizard makes it simple to create a new TypeScript project, creating a sample TypeScript project with sample tsconfig.json and package.json configuration files. You can edit the tsconfig.json file to customize configuration. CodeMix provides several refactorings to help you produce cleaner code. The ability to rename symbols in your TypeScript source is popular, but there’s a lot more you can do! A number of refactoring options are available from the command palette, including the ability to extract code to methods and variables. Quickly jump to symbols from the Outline view or Quick Outline. You can also quickly navigate through your code with Hyperlink navigation or the Go to Definition command.